Dr. Klaus Berghäuser, born 1952 in Wetzlar, studied law and political sciences at the Justus Liebig University of Gießen from 1971 to 1976. After his first bar exam, which he passed with distinction in 1976, he also did his doctorate at the Justus Liebig University, with a dissertation on “Freedom of association as a fundamental democratic right”. During his studies, he was holder of a doctoral scholarship of the Friedrich-Ebert Foundation. 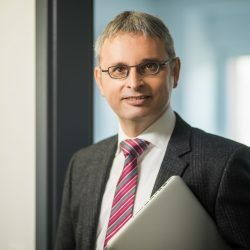 Klaus Berghäuser completed his legal clerkship from 1979 to 1982 at the Regional Court of Gießen with a focus on administrative law and passed the second bar exam with distinction in 1982. Klaus Berghäuser has been admitted to the bar since 1982 and in 1986 the firm incorporated him as a partner. He has been a specialist lawyer for administrative law since 1988 and he was appointed notary in 1996. He completed his training as a mediator in 2004. The focus of my professional activities is on public law, which has already been a priority during my studies and legal clerkship. My involvement as a specialist lawyer primarily includes public building law, technical planning law, environmental law, community law and commercial administrative law. This includes both the competent handling of factual and legal issues and the search for practicable solutions in out-of-court proceedings, as well as the professional conduct of lawsuits. An important focus of my activities in recent years has been the legal review of planning permissions for the expansion of Frankfurt/Main and Kassel-Calden airports. In both cases, I represented adjoining municipalities. Legal cases in the area of large-scale retail, municipal commercial law, urban development contracts, water law, municipal constitutional law and press law also characterise my department. Clients often entrust me with the preparation of acedemic opinions on central administrative law issues. I have been representing many cities and municipalities as well as municipal corporations for a long time. I have consultancy agreements with a large number of companies as well as municipalities which do not have their own legal department. I continually support a major discount food retailer in construction planning issues, as well as in notarial matters. Numerous client relationships have existed for many years. They are all based on strong personal trust as well as great esteem and mutual respect. These are some of the reasons why I enjoy working as a lawyer so much. My clients strive for constructive solutions. They value competence, knowledge, experience, expertise, creativity and humour. That is why they make use of my services. If a cooperative approach of conflict handling is preferable as an alternative to a contentious dispute, I offer the implementation of mediation procedures as well as the moderation of citizens’ meetings and planning processes. In the list of lawyers of FOCUS magazine I received the most recommendations in the field of public building law in Hesse. Since 2003, the JUVE handbook „Corporate Law Firms“ has honoured my legal commitment in the categories “Leading Names in Hesse” and “Frequently Recommended Lawyer”. The client review in the JUVE handbook of 2017/2018 reads as follows: “Specific expertise in energy and building law; clear and implementable recommendations”. In 2017 I was awarded the “Legal Award” by Lawyer Monthly Magazine in the category “Administrative and Public Law – Law Firm of the Year – Germany”. My legal activities in public law complement a selective department in civil law and corporate law, as well as my notarial work and a number of scientific publications. Berghäuser, Eine Frage der Wahrheit? Zur Oberbürgermeisterdirektwahl in Bad Homburg, NVwZ 2003, p. 1085 et seqq. Berghäuser, Die Rechtsprechung des Hessischen Verwaltungsgerichtshofs zum Bürgerbegehren und Bürgerentscheid, Hessische Städte- und Gemeindezeitung 2004, p. 243 et seqq. Berghäuser, Lösungen gemeinsam erarbeiten, Mediation, IHK-Report Südhessen, 12/2006, p. 12 et seqq. Berghäuser/Born, 15 Jahre Bürgerbegehren und Bürgerentscheid in Hessen: Bestandsaufnahme und Perspektiven, Hessische Städte- und Gemeinde-Zeitung 2008, p. 246 et seqq. Berghäuser/Berghäuser, E-Partizipation und frühzeitige Öffentlichkeitsbeteiligung in der Bauleitplanung, NVwZ 2009, p. 706 et seqq. Berghäuser, Die Aufnahme und Entlassung von Mitgliedern bei wasserrechtlichen Altverbänden, ZfW 2010, p. 96 et seqq. Berghäuser/Gelbe, Drittschutz der verschärften Subsidiaritätsklausel in den Gemeindeordnungen der deutschen Flächenstaaten – eine vergleichende Betrachtung, KommJur 2012, p. 47 et seqq. Berghäuser, Restriktionen der kommunalen Bebauungsplanung, Hessische Städte- und Gemeindezeitung 2015, p. 374 et seqq.